In the middle of the night, my father told me that he had crossed where the river ran thin, a strip of muddy water no more than ankle deep, easy enough to keep your shoes in one hand and slip to the other bank, roll your pant legs back down and stroll over to the cantinas just a street over from the bridge. If you timed it right, he said, you could cross at dusk before the mosquitoes got bad or the snakes slithered out to feed, easy as can be, so easy, and no one would think twice if you made your way to El Gallo de Oro or El Tururú and spent the whole night eating American hamburgers and drinking ron y cocas. My father’s voice had roused me from sleep. It was past three in the morning, long past the nurse’s time to draw his blood, and the ward was quiet. He had offered the story unprovoked and unbidden, eyes closed to what he had offered, as if he was drawing the story straight out of the air. I had followed the story along with his soft breathing, stayed with him as he paused midstream. I had believed he had been speaking to me and when I heard him say río, I stepped right in for the crossing. I did not recognize this story. Was it that I didn’t remember or that this was the first time he was telling it to me? The speech therapist had advised me to keep him talking, to ask him questions, but his hands stayed still, his legs not fitful. I did not want to interfere with his rest, but when I realized he was speaking about the crossing as a pleasure, as a night out on the American side, I sat up in my chair and looked at him. In the morning, when my mother came to help him with the seven a.m. breakfast, I told her the story he had shared. She puzzled over it. El Gallo de Oro, she wondered. No, that didn’t sound familiar. But his habits did. She adjusted a bib on my father and attempted a spoon into his hands, guiding him to stir his own coffee. He was still having trouble with his vision and lifted his head to us for prompting. Ándale, she encouraged him, moving his wrist in a circle. Like you used to do to get rid of those hangovers from El Gallo de Oro. Later, while he was occupied with a physical therapist helping him to safely rise and sit in a chair, my mother muttered that she wished he wouldn’t talk about his old habits anymore. It was hard enough, she said, to get him to remember the here and now. To be thinking about all the drinking he used to do—she shook her head. Of all the things to remember, she sighed. He was young once, I told her. ¿Verdad? she agreed, as if resigned to the potential shame my father might bring into the room with what he struggled to remember. We sat watching my father practice with his chair, settling into this new truth. I was about to tell her that it was a shame that was no different than the first time I watched the nurses help bathe him, but she spoke first. He crossed from Tijuana at a border station, she said. Through the turnstiles without planning to come back. That’s how it was in those days. I don’t know why he’s telling you about a river. That night, after the nurse had given him his evening pills and tucked the blankets around him, I asked him where he had crossed. I thought you crossed a few times and then kept going north, I told him. At least, that’s how you always made it seem. You crossed to work. Not always. Sometimes I crossed to play. Viejas por dondequiera and they didn’t care if you were from México, as long as you could buy them a drink. But you didn’t have money, I said. That’s why you came up north. Because you didn’t have anything. Where you get the money to buy these drinks for the ladies? My father only laughed at the question. You hear me? I asked him again. I thought you didn’t have money. His eyes stayed open, but he wouldn’t answer. How did you get money? I was a singer, he said. You worked in the fields, Dad. No, no, he said. He got wistful and he stared past me to the television set in the corner of the ceiling, as if the blank screen could suddenly display what memory had hazed. I’ve never heard you talk about being a singer. Not once. I could hear his voice choking a bit, so I eased off disagreeing with him. I wore a purple shirt once, he said. Yes, he nodded. And the shades. The shiny-mirror shades, like the American cops. You wore a purple shirt and shades to sing? Yes, he said. A couple of guys played instruments and we would do three or four songs. What kind of songs did you play? He thought about it. Not too fast and not too slow. I’m telling you, he said, and he closed his eyes and drifted off to sleep. You never came up through Texas, I said. The next morning, my mother was late and unrested. She cut my father’s breakfast sausages into manageable bites with a quick and sharp impatience and I was going to let the singing story go, but a nurse walked by. Trying to be helpful, she leaned over and encouraged my mother to hold a conversation with my father. What did you do yesterday? the nurse asked. When the nurse walked away, I told my mother the story he had shared. She didn’t interrupt and didn’t look at my father until I finished and then she turned to him. Mentiroso, she said. Do you know how far Matamoros is? That’s near where I grew up in Texas. Maybe some of your friends crossed over water, she said, but not you. Tell me the road then, my mother said. The road that goes all along the river, all along the border up to Van Horn. You’re good at roads. When he had been well, my father liked to take out the road atlas that he picked up at a Texaco, turning the pages at the kitchen table, tracing roads he’d been on, roads he wanted to be. Tell me the road, my mother said again, wiping at his chin. And then, to me, I’m telling you, it was Tijuana. My father didn’t take her admonishments or corrections well. Normally, he was cheerful with the therapists during his sessions, but he was sullen and difficult even with them. Finally, they took him to his room early in the afternoon, encouraging him to rest, and when I arrived for the dinner hour, my mother was exasperated by his stubborn silence. He’s been like this all day, she told me. I wish you wouldn’t ask him questions. You don’t know when he tells you the wrong thing. I wanted to say that there was a time before her, that my father had once been a young man. It was possible, I wanted to say, that the hard journey up from central México up to California could have gone another route, one that he never told her about. But I knew I was wrong. When I thought about the distance between those places—the cold blue harbor of San Diego and its rich boats bobbing, the humid green-gray of the Gulf hundreds and hundreds of miles away—I knew it was impossible for my father to have made such a long trek. In the eating room, we joined the other patients and the three of us sat with my father’s dinner but he refused to handle the spoon. The nutritionist, seeing his almost-full tray, passed by and encouraged us with his feeding. Come on, Dad, I said, and I skipped right over to his favorite, canned peaches. Maybe it was El Paso, I offered. Sí, pues, he said, and took a bite. He chewed and, realizing what he had eaten, opened his mouth for more. El Paso? my mother asked. El Paso, said my father. ¿Y qué pasó en El Paso? I asked, before she could say anything. I wanted her to understand that I just wanted him to speak. Chingadazos? You got in a fight, Dad? Marina? my mother asked. Marina, my father insisted. En El Paso. He was so distracted by his storytelling that he had forgotten to be angry and he let me spoon bits of his real dinner into his mouth, the peaches long gone. He finished his last bite and said, Marina. When he didn’t answer, I started to clear the tray. He does this sometimes, I started to say. Yo conozco a todas tus chingadas viejas. It’s just talk, I said. In his room, we settled him into bed, my mother no longer encouraging him to tell this story. She was exhausted by his talking and I knew better than to encourage him to keep speaking, whatever good it would do for his recall. My father, maybe from the food or maybe from all the talking, closed his eyes immediately and let out a gentle snoring. Viejito, my mother called to him, even though his eyes were closed. Is Marina still alive? His eyes fluttered open. ¿Qué? He thought about it a moment. I don’t know, he admitted. My mother stood up and walked to the side of his bed. What happened to her? Is she still in El Paso? My father got quiet. He stared up at her, searching her face. She was in the hospital for a long time, just like me right now. Why was she in the hospital? Do you remember? When the police chased us, my father said, and we wrecked the car. They arrested me and threw me in jail, but she was in the hospital. Just like me right now. I watched my mother stand over my father for a long time as he slipped into a light sleep. She loved him, I knew. She stood there a long time, I thought, because she didn’t want to face me. She started shaking her head at him, then turned to me. Son tan pendejos los dos, she said, and then she let out a laugh that stirred my father awake. What’s so funny, I asked. He’s remembering his favorite Rigo Tovar movie, she said. From years ago. He was a big singer back in the day and he liked making movies out of his life. Pendejos. Who’s a pendejo? my father asked. You. For thinking you crossed at Matamoros like Rigo Tovar. El Paso, my father insisted. Matamoros, my mother corrected him. Rigo Tovar was from Matamoros, not you. And he was going blind, not you. Your eyes are going to get better, you’ll see. I was in El Paso. I crossed the river. You crossed at a border station in Tijuana, my mother said. Now be quiet and get some rest. En Yuma, my father said. Tijuana, I told him. You crossed at Tijuana. But what did it help to get the story straight? Yuma, my dad said more sternly and started rising from his position in the bed, agitated. We calmed him down a bit. Bueno, bueno, Yuma, my mother said. Yuma, it is. She watched my father as he quieted down into a deep sleep and when the nurse came in to check him for the last evening round, my mother prepared to leave. She looked reluctant to do so and I thought, for a moment, about promising that I wouldn’t ask my dad any hard questions. I would ask only the ones that bored him, the ones the nurses posed to him. What is your full name? What day of the week is it? Do you know what month it is? When is your birthday? Did it rain yesterday? The nurse walked out but my mother stayed behind. She looked at my father resting. Me quedé pensando, my mother said. Marina….Marina…and then that story that I swore I heard before. I don’t know why he’s thinking about Yuma but I can tell you he didn’t cross there either. He’s confusing it with El Centro. California. They look the same. Desert towns with nothing around them and nothing to do. I used to drive from Fresno all the way down to Tijuana to pick him up whenever he got deported. We would drive straight up back through Los Angeles and back to Fresno. One time, he showed up in Tijuana with some mexicano he had become friendly with and he wanted to help him up into the Valley. I was scared we were going to get caught and I didn’t want to drive up through Los Angeles, so he said let’s go around it—my mother motioned with her hand, over and then up, the open desert toward Indio, then up through San Bernardino. I was so angry with him, but what choice did I have? Sure enough, the migra stops us outside of El Centro and they haul your father and his dumb friend away. Me, they impounded the car and threw me in jail for the night. The next morning, they let me out and offered me a ride into town, but I told that border patrol agent what he could do to his mother and I walked out. This is why I remember that it was El Centro, my mother said. Because that border patrol station was five miles outside of town and there I was, walking the desert highway like a pendeja, in that heat. A big rig passed by and the man offered me a ride and I got in. He drove me into town and left me at the bus station and it was right there—the El Centro bus station—where these women getting off work from a cannery saw me standing there like I didn’t know what to do. They got me a ticket home. And I thought the whole way back about walking in the desert and how stupid I was to get in that big rig when I had my kids to take care of and how lucky I was that those women helped me. I was very, very lucky. Yuma, my father said, half-dozing, as if he’d been listening the whole time and had been waiting to correct her. El Centro, she said, more forcefully, as if it would hush him back to sleep. It’s El Centro, my mother said softly to me, finally turning to the door. It was her turn to go home and rest. The state line, she said. I hated crossing the state lines when I left Texas and I was too proud to cross anything again. La pura verdad, she said. I don’t forget. I won’t ever get confused. I remember that highway sign. El Centro-Yuma-Phoenix. I never had to cross a border like your dad, but I remember. Pobrecito. I love your father, but believe me. No soy tan pendeja. 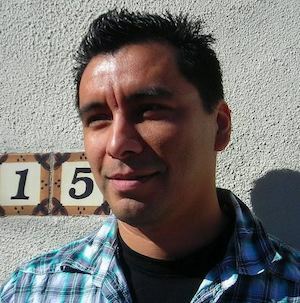 Manuel Muñoz is the author of two story collections, Zigzagger and The Faith Healer of Olive Avenue, and a novel, What You See in the Dark. Work from a third collection has appeared in Glimmer Train Stories and American Short Fiction and is forthcoming from The Southwest Review. He lives in Tucson. I grew up on Umbrella Street in Dinuba, California, in a house that my parents bought for $4000 in the late 1960s and sold thirty years later. The house had no insulation, a single gas heater in the living room, a swamp cooler in the summer. The city, in a renewal effort, began remodeling homes on the south side through a loan program. Ours was one of the first. That was the house I left in 1990 when I was eighteen. Google Maps can take me there now, of course, but I recognize none of it. The blackberry bushes are gone. The street is fully paved. I don’t linger on Google Maps long enough to look at the house. It is someone else’s home now and I have to respect that.